Introducing Our Premium, Vibrant, Full-Color print of the LDS Sacred Grove - Witness Tree in Palmyra, NY! This beautiful full color print has been designed to make a lasting impression in your home or office measuring 20" x 16." Our Sacred Grove print has been professionally calibrated for vibrant true-to-life colors portraying a "Witness Tree" thought to have been present when Joseph Smith received the First Vision. This print is Perfect for yourself, or can be given as a gift for a baptism, seminary students, college students, missionaries, friends or family. Printed on High Quality Premium Archival paper you are sure to be pleased with the high resolution and clarity. This stunning image is perfect to frame and mount on any wall in your home or office as it beautifies and invites the Spirit. We worked hard to ensure this image is printed with superior quality, shipped without blemish and ready to frame upon receipt. Rolled into a sturdy white impact-resistant shipping tube makes it aesthetically pleasing and you can be confident giving this as a gift to your kids, spouse, parents or friends! 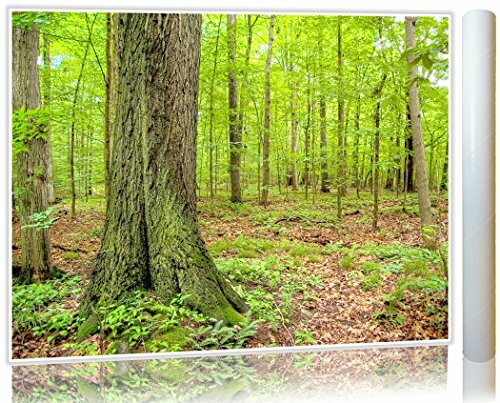 We have a 100% Money Back Guarantee if you are dissatisfied in any way with your Sacred Grove - Witness Tree print. Relax and enjoy this beautiful image of LDS church history. Please visit https://www.amazon.com/latter-daystrengths for more LDS fine art. LARGE (20" X 16") LDS SACRED GROVE PRINT on High Quality Premium Archival paper, LDS art, Perfect to frame and hang in your home or office. Has a 1/8" white border on all sides. FULL VIBRANT TRUE-COLOR HIGH RESOLUTION has been Professionally shot and Designed with Eye-Catching colors and layout. 1/8" white border on all sides. If you have any questions about this product by Latter-day Strengths, contact us by completing and submitting the form below. If you are looking for a specif part number, please include it with your message. Farmhouse Bathroom Art Set of 3 5x7" Prints. Teal, Aqua, Black, Blue.